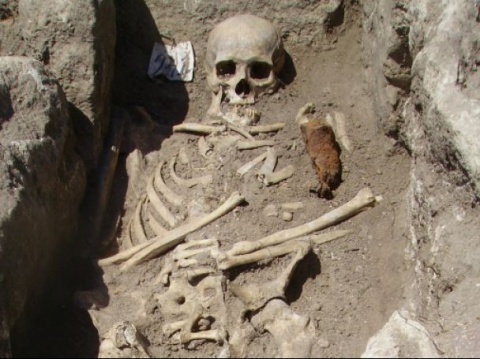 The "vampire" skeleton that was recently discovered by archaeologists in a grave in Bulgaria's Black Sea town of Sozopol has been identified as a pirate and mayor. According to Bulgarian archaeologists and historians, the skeleton, which was said to be a vampire because it was found buried with an iron spike thrust into his chest, most likely belonged to a noble named Krivich who lived in the 14th century. "The vampire from Sozopol most likely was called Krivich, and was a pirate. And he certainly wasn't a vampire when he was alive. It is just that the people were afraid that he might become one after his death," explained Thursday Prof. Bozhidar Dimitrov, head of the Bulgarian National History Museum. It is at the initiative of Dimitrov (himself a native of Sozopol) that the skeleton "treated posthumously against vampirism" has been transferred to Sofia, and will become part of the National History Museum's permanent display as a testimony to folklore in the Middle Ages. "He must have been a bad man. A very bad man. So according to the beliefs in the Middle Ages his soul couldn't go to heaven. It was to remain in the body, suffer, and sometimes would rise from the grave to drink blood from animals or humans. That is why the soul had to be killed symbolically with a sharp spike but not a weapon," Dimitrov explained. In his words, in addition to being an evil man, the Sozopol "vampire" was also a member of the local nobility because otherwise he would not have been buried next to a church where his grave was found. Thus, Bulgarian historians believe that the vampire grave most likely belong to one of the medieval mayors of Sozopol. The man's name was Krivich, and he is known to have had a background as a pirate and bandit who exemplified evil for the town which was part of both the Bulgarian Empire and the Byzantine Empire in the Middle Ages. "He demonstrated incompetence when defending the town from a siege. As a result, Sozopol was overrun by the Genoese who took everything away from the local residents," Dimitrov said. In his words, the using of metal spikes on dead bodies was a usual precaution against vampirism in the 13th-14th century, and that these precautions were even the matter of a distinct science called demonology. He notes that the Sozopol "vampire" did not in fact have spiky teeth as in Hollywood movies, and that "with blunt teeth and a spike in his chest his vampire career ended before it could start."